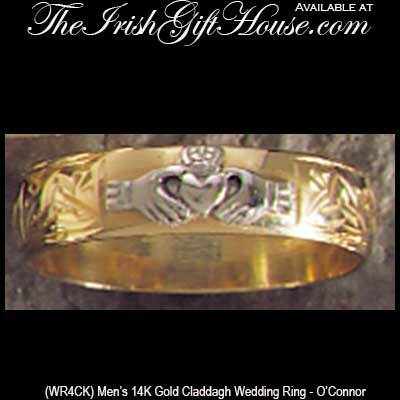 This men's 14K yellow gold Claddagh wedding ring features a white gold Claddagh symbol along with engraved Trinity knots on the band. This 14K yellow gold Claddagh wedding ring for men features a superimposed white gold Claddagh symbol along with engraved Celtic Trinity knots. The gold Claddagh wedding band measures 6mm wide and is enhanced with diamond cut beveled edges extending around the band.